OB companies are increasingly investing in 12G infrastructure to capture the cleanest possible source UHD. Some companies see UHD as a logical progression when their HD equipment needs replacement. Others are more bullish, recognising the advantages of keeping up to date with the latest standards. 12G is also potentially useful in an HD production because it allows a producer to crop HD video selectively from a UHD source. The transition from SD to HD was largely price driven as manufacturers geared to offer HD products at prices previously associated with SD equipment. We anticipate the 3G HD to 12G UHD transition following the same pattern, powered by the accelerating public demand for UHD content from online content providers. There is obviously a big advantage in shooting new content in UHD rather than HD to maximise its future value. Demand for high speed cameras to deliver slow-motion coverage of sports has increased significantly over the past couple of years. The Sony HDC-4800 can shoot full-resolution progressive UHD at up to 8x or HD at up to 16x. The EVS XT3 slow-motion server supports every super motion camera on the market and provides native options for up to 12 record channels with proxy encoding in SD and HD, eight channels of 1080p or three channels of UHD-4K in any in/out combination. Camera robotics have advanced a lot in recent years. We are investing in remotely controllable pan/tilt/zoom/focus (PTZF) camera heads which can be steered and fine-adjusted by an operator from a distance of a few metres, half a kilometre or (via IP) half way round the world. Remote Live Production (RLP), where practically all camera control is via long-distance IP, has been mooted as a successor to traditional OB operation. The economic attractions are obvious given the reduced need to field elaborate production vehicles and large crewing teams. But the practical problems are equally obvious, especially latency if an operator in London is trying to track a pole-vaulting athlete in Tokyo. If RLP takes off, we are ready to respond quickly to market demand. Finepoint Broadcast has been supplying the television industry with a wide choice of production and OB equipment for nearly 35 years. The company's starting point was to offer customers an alternative from the high capital cost of buying project-specific kit to handle a short-term project. Finepoint continues today supplying the very latest equipment for many large scale sporting and entertainment programmes in the UK and internationally. A vital aspect of the hire business is careful attention to detail, ensuring all the vital cables needed with a product are actually in the box when the client needs it and do actually work when connected to form a system. Discovering that at vital element of a rig is missing or defective is stressful enough for broadcasters or production staff working at their base studio, and a great deal more if they are operating on location. Equipment purchases are based on frequent discussions with regular customers about their likely needs in the mid-term future. We are a listening company and invest on a basis of proven demand rather than chasing new technology for its own sake. We also monitor technical trends at major shows such as NAB and IBC Keeping our eyes and ears open ensures we are not wrong-footed in our investment strategy. A key element of success in the modern broadcast equipment supply sector is being seen by clients as a technology provider going beyond traditional dry-hire. We now have a hire and sales divisions working together to enable a constant flow of the very latest equipment in our rental fleet. When ready, we release into the market well maintained ex-rental equipment in excellent condition. Our investment plan for the 2018-19 financial year alone anticipates a £2 million spend on new equipment which will equip the hire fleet to the latest technical standards, including 4K/UHD and HDR. We have already taken a delivery of Sony HDC-4300 and HDC-4800 cameras and associated 4K Canon lenses. Other recent additions include EVS XT3 ChannelMax and XFile3 production servers. It is obviously important to provide the expertise essential to ensure returned equipment is maintained in first-class condition. 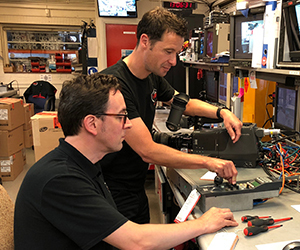 We are one of the few hire companies that employ a team of full-time bench engineers to ensure we not only deliver great kit but clients know it has been through engineering checks before it goes back out on hire. Our technical team includes Michael Bullions, Lenzel Dyke and Richard Morey, led by Chief Engineer Andrew Mckenzie.